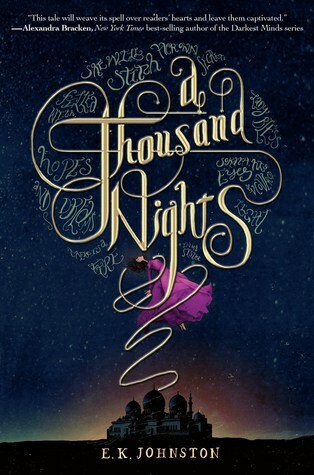 Ok, so A Thousand Nights was not nearly as amazing as its perfectly stunning cover. However, aside from its slow, meandering plot, the books had several merits and I would not hesitate to recommend it if your TBR is looking empty. Every time, the story began the same way. Lo-Melkhiin picked one girl and took her back to his qasr to be his wife. Some in his keeping lasted one night, some as many as thirty, but in the end all were food for sand-crows. A fairy tale retelling of 1001 Nights, this story follows an unnamed narrator, who volunteered as tribute when Lo-Melkhiin visits her village to save her ‘sister’. Like Scheherazade before her, she finds herself surviving the ordeal beyond the first night, and begins to work at ending the cycle of violence. In the fire of our twelfth summer, before we were proficient enough with our needles to stitch the purple cloth, but after we had come in from the herds, my mother and my sister’s mother told us the story of our father’s father’s father, and how he had become our smallgod. Where our skin touched, there was a fire of a different kind. I thought I could see it, threads of gold and blue, desert sand and desert sky, bleeding from my body into his. No single tale that I could draw from would save my sister from a short and cruel marriage, but I had pieces aplenty. I held them in my hands like so many grains of sand, and they slipped from me, running through my fingers, even as I tried to gather more. But I knew sand… I knew that I had only to hold it for long enough, to find the right kind of fire, and the sand would harden into glass- into something I could use. I had long ago resigned to a life in the shadow of my sister, my elder by ten moons and my year-twin. She was the beauty, I was the spare. Instead of being focused on the romantic aspect of the story, like The Wrath and The Dawn, this book highlight the friendship between the narrator and her sister. Even when she is taken to Lo-Melkhiin’s qsar, the narrator’s thoughts remain on her sister and how to keep her safe. I love that the stories she tells Lo-Melkhiin are ones of her sister, of how beautiful and bright she burns, and of how he shall never have her. There’s in fact no real focus on romance at all, which is refreshing to see – but fresh off the high of The Wrath and The Dawn, it did make me mourn for what could have been. I enjoyed the mythology hinted at in the novel, especially one involving the devotion of friends or family turning someone into a smallgod, capable of small miracles. Demons also make an appearance in the novel, though I felt that the supernatural element of the story was never fully fleshed out. We see the narrator hallucinate, literally weaving visions out of cloth, but we are never quite told how it happens. I wish the book wasn’t so wishy-washy about the magical aspect of the story, as it took up quite a bit of the text. Honestly, the most disappointing aspect of this novel is the turtle pacing of the plot. As soon as the narrator reaches the qasr, all kind of action stagnated. She spends her day shuffling from gardens, to weaving room, to servant’s quarter, all relatively uneventful. Aside from her seemingly random vision, nothing was driving the story forward. We were made aware there’s a menacing presence lurking within Lo-Melkhiin, however neither it nor the narrator made any real effort to challenge the other person. I was bored to tears in between the long winded descriptions and the stasis of the plot. Hence, despite the GORGEOUS cover and palatable writing, I can’t rate it higher than a 3 stars out of 5. If you’re looking for an excellent 1001 Nights retelling, go read In The Night Garden by Catherynne Valente instead. If you’re looking for a romantic story in s similar setting, just go read The Wrath and The Dawn. I’d save this one for a rainy day. Great review! I was really excited to read this one but unfortunately could not connect to it at all, although it did have it’s moments. Aw that was similar to my experience, like nothing was offending me or overtly terrible, I was just really put off by the pacing. Lol, I’ve actually put this book as the next thing I was reading from my Netgalley list. I was also drawn to the cover (I mean, how could you NOT be, it’s gorgeous!). I’ve DNFed a book recently for an overglut of description and slow plot (well, for more things than this, actually), but from the looks of the passages, it’s not nearly as clunky as the book I didn’t finish. That cover is way too glorious, like there’s little words floating next to her and the typography and the ribbon!! Have you seen the hardcover edition in the UK? That is so beautiful as well. I think this is a book you’ll have to be in the mood for, as if you’re already in a mood for a quicker paced book – the plot advancement in this one will kill your patience haha. Eep. Yeah, both covers are awesome! And lol, I think I’ll start it after I get done with A Darker Shade of Magic. Been listening to the audio book and it’s very good, albeit in that descriptive, slow-marching manner. OMG A DARKER SHADE OF MAGIC! I am so happy you’re listening to it, I love that book so much! Isn’t Lila amazing?! I have the world’s largest girl crush on her. Haha, I currently have a love-hate relationship with Lila at the moment, though after burning down an entire establishment, I’ve decided that I ultimately like her badassery. But omg those Dane twins though! Gave me shivers when the narrator got to them. I don’t know how I feel about characters that don’t have names. Definitely not my style, but great review anyway! Yeah, I’m going to stay away from NetGalley for a little. Going to stick to reading what I know I’ll like! Aww I read about this book earlier and it sounded interesting and the cover is BANGING. But I think I’ll check out your other recommendations first. Great review by the way! Yes! I especially recommend In The Night Garden, truly a beautiful book! I think there are some merits to this book so even if you wanted to read it purely due to cover love, I would say go right ahead! I felt the same way…the cover drew me in but this book was a let down. The writing was beautiful but that’s the only thing I liked. I’m glad that at least the writing worked for you! The pacing for this book really puts me off it. Hope you are having better luck with your next reads! Love the review! How did you finish this book? I tried so hard, but just I couldn’t do it. I make a point to not DNF anything, especially if it’s an ARC. BUT I am sorely tempted at the moment while reading Hunter, haha. I was sorely disappointed with The Wrath and the Dawn because the prose didn’t work for me and the romance felt chemistry-less as well. So I’ve been pinning all my hopes on this one. The writing sounds like it would take some time to get used to. And I’m actually glad this focuses on the siblings relationship rather than the romance. I’ll keep what you said about the slow pace in mind, when I get to read this one sometimes soon. I hope you’ll like it more than I did, Nick!! I actually had loads of issues with The Wrath and The Dawn but I am not gonna lie, I adore the main OTP so much I’m willing to turn a blind eye to it haha. Good review! This book has a gorgeous cover, which drew me in, but I like the sound of your other recommendations better. Both the UK and US covers are so gorgeous. I’m still thinking of buying the UK cover because that thing is a work of art haha. But yes, check out the other recs first! I just looked up the UK edition – I agree, it’s beautiful!!! The art on the page edges is amazing. Great review! I don’t mind purple prose, as a matter of fact, I enjoyed every excerpt you posted even the one you disliked, lol. However, I really don’t feel like reading a book without a slow and vague plot. Besides, fairy tale retelling tend to not be my thing. 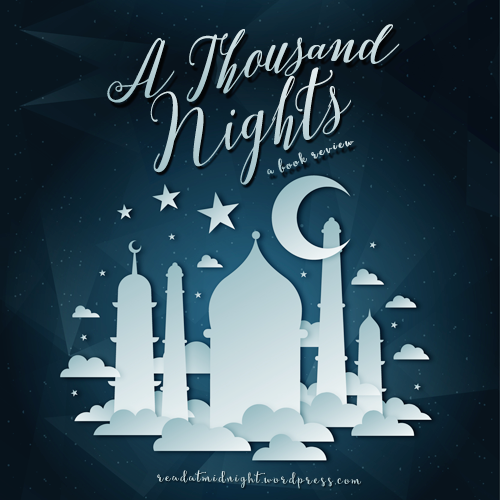 So I doubt A Thousand Nights will hit my shelves any time soon. Oh man, I think I need to give this book a pass, or read it when I’m really perked up on caffeine… that kind of writing makes me sleepy! Combine with the slow pace, and I think I wouldn’t get more than a few pages in before needing a nap. But that cover is sooooo pretty! It’s a bit slow but if you like the writing I think you’ll do fine with this book. Omg I still can’t get over this cover, and have you seen how well made the HC UK version is?! I wanna buy it despite reservations about the book haha. Fantastic review! 🙂 I have been looking forward to this one. I am so sad that it wasn’t great like The Wrath and the Dawn. It is going to be very hard for me not to compare them. I like that it centers on friendship, but the pacing sounds like its going to bore me too. I think I may still give this one a try. I absolutely love the cover (I know I am shallow) and I really want to read more fairy tale retellings. Nice job reviewing this one! What a wonderful review, as usual. This book has been on my TBR for a while now. It seems that recently there has been the emergence of fiction retellings of A Thousand and One Nights. It’s going to be hard for another retelling that lives up to The Wrath and the Dawn – at least for me! This is completely nothing like TWATD so don’t expect that or you’ll be so disappointed like I was haha. No Khalid here! Yes there’s certainly loads of Arabian inspired books out these days, I hope the trend is here to stay! I think you’ll adore The Wrath and The Dawn! I am so excited for you haha. Can’t wait to hear what you think of it Summer! I think I can safely and honestly tell you that you should skip this book. I’ve been wanting to read this one for a while – I’m iffy when it comes to slow pacing though – sometimes it works for me, and sometimes it doesn’t. But purple prose would definitely get on my nerves! It’s still on NG so check it out there if you’re interested? Be warned that the plot basically goes nowhere for 80% of the book, though! Oooh interesting to know Aentee! I received a copy off Netgalley too, and have been waiting for the right time to read this book. I’m not a hater of purple-prose, but like yourself I do have my limits. I think I might actually read this one before The Wrath and The Dawn though, just in case I start comparing. I’ll go into this book with an open mind and see how I fare. Thanks for the honest review! Yes, read this one before TWATD or you’ll be judging it against such unfair competition XD I know a lot of people actually found the writing the most enjoyable part of the book, so you might like it despite my reservations! Ooo I would love to hear what you think about In The Night Garden when you do read it! It is so beautifully written and turned trope subversion into an art form. I loved the varied set of female characters as well. I personally enjoy more lyrical and descriptive prose as well, but yeah, judging from the quotes, this seems to be taken to the extreme. The friendship aspect actually sounds quite tempting, though, since the Khalid/Shahrzad (that was much easier to spell than Daenerys Targaryen or Celea(??? )na) ship didn’t quite sail for me personally. I love lyrical proses but this book was TOO MUCH. If it takes you one paragraph to describe a dress, you are probably doing it wrong? The friendship/sisterhood was a very nice touch though and it saved the book from two stars haha. I had my reservations for Shazi/Khalid initially but I have seen the light now haha. I think I’ll take your advice and read In The Night Garden instead. I am a huge fan of 1001 Nights but not much of a fan of a sluggish story. Hah, I read THE WRATH AND THE DAWN and was actually quite disappointed of its heavy emphasis on the romance and the lack of on the curse/plot/backstory/world-building 😛 I totally understand your points why you didn’t like this, though. I’m actually more tolerant when it comes to slow pacing. Sometimes, if there is enough emphasis on world-building and other book elements, I appreciate the slow pace because it makes me immerse myself in the story more. I’d have to give this one a try! Pretentious is the perfect word for this book, haha! It’s quite different from TWATD though, so if you are in the mood for an Arabian setting, give it a go! Yesss, the magic of 1001 nights is in the tale that Scheherazade tells, this girl told no story except her own… and what even happened in the middle 200 pages? I suffered through them and yet I can’t recap the events to save my life cos nothing happened apart from her spinning yarn and hallucinating. I WAS SO DISAPPOINTED. Cos cover, pretty, etc! Oh wow, thanks for the warning on the purple prose that you highlighted! You definitely need to be in a thinking mood to read this one, although I didn’t mind the excerpts that you picked out so much. I like the sound of the mythology, although it sounds like it could be frustrating!